This article is about the island. For other uses, see Market (disambiguation). Märket Island with the unusual national border of 1985. Märket ("The Mark", Swedish pronunciation: [²mærːkɛt]) is a small 3.3-hectare (8.2-acre) uninhabited skerry in the Baltic Sea between Sweden and Finland (in the area of the autonomous Åland Islands), with a lighthouse as its salient manmade feature. Märket has been divided between the two countries since the Treaty of Fredrikshamn of 1809 defined the border between Sweden and the Russian Empire as going through the middle of the island. The Finnish side of the island is part of the Municipality of Hammarland and is the westernmost land point of Finland. The Swedish part of the island is itself divided by two counties of Sweden: Uppsala County (Östhammar Municipality) and Stockholm County (Norrtälje Municipality). The 6-nautical-mile-wide (11 km; 6.9 mi) Understen–Märket Passage links the Bothnian Sea to the Baltic proper. The skerry is roughly 350 metres (1,150 ft) long by 150 metres (490 ft) wide, and its area is about 3.3 hectares (8.2 acres). It is the smallest sea island shared by two countries. The name Märket ('the Mark') probably comes from its usefulness as a navigation mark before there were lighthouses. The route between Sweden and Åland has a passage of about 27 kilometres (15 NM) (17 mi) length over open sea. Before the lighthouse, the island and its shallows were dangerous navigational hazards, which seafarers tried to desperately avoid. In 1873, as many as 23 ships were grounded on the Swedish coast and its archipelago trying to avoid Märket, and eight of them were shipwrecked. Märket is detached from the main Åland archipelago, with the closest island more than 10 km (6.2 mi) away, and the closest harbor, Berghamn, 23 km (14 mi) away in Eckerö. There is no deep harbor; the island can be only reached with boats. There are small, barely surfacing rocks northwest of Märket, called Märketshällor ("stones of Märket"), which are too small to sustain vegetation. The island consists of mostly smooth diabase rock, with a maximum natural elevation of two meters. Most of the area is regularly washed over with seawater in storms, and scoured by drift ice in winter. Plant life, which is limited to low-growing grasses and herbs, persists only in some protected spots. Twenty-three plant species have been identified altogether. The halophilic grass Puccinellia capillaris and the herbaceous Sagina nodosa (knotted pearlwort) are found scattered throughout the island. Among rarer species, Spergularia marina (salt sandspurry) grows on Märket. Salix caprea (goat willow) grows on an abandoned building. There are large grey seal communities around Märket, and Märket has been a target for seal safaris. There is a lighthouse on the Finnish side of the current border, which has been unmanned and automated since 1979. When it was built by the Grand Duchy of Finland (then part of the Russian Empire) in 1885, the island was considered a no man's land, so it was simply built on the highest point on the island. However, this meant it was built on the Swedish part of the island. As a result, the border was adjusted in 1985 so that the lighthouse is now located on Finnish territory. The adjustment was carried out such that no net transfer of territory occurred, and the ownership of the coastline was unchanged so as not to interfere with each country's fishing rights. This resulted in an unusual shape for the international border which satisfied both Finnish and Swedish interests. 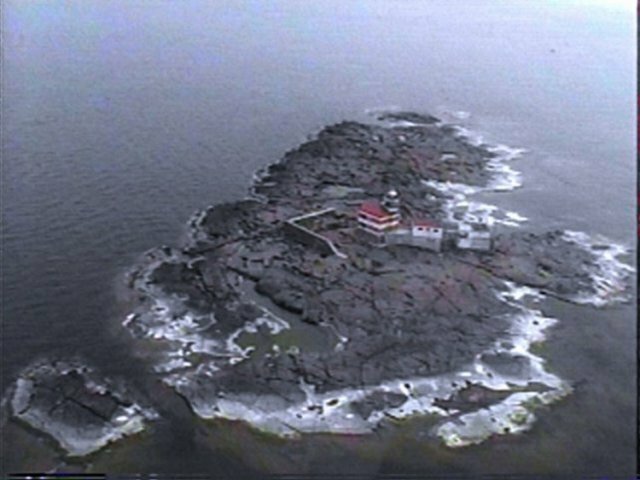 The adjusted border takes the form of an inverted 'S', and the lighthouse is connected to the rest of Finland only by a short stretch of land. The border is regularly resurveyed every 25 years by officials representing both countries. The last such joint inspection took place in August 2006. The border is marked by holes drilled to the rock, because the seasonal drift ice would shear off any protruding markers. Due to the Nordic Passport Union and the Schengen Agreement, there have been no passport checks or other border formalities at the border since 1958, so intra-Nordic/intra-Schengen visitors may visit the island freely. Both sides are officially monolingually Swedish-speaking, the Finnish side as a part of Åland. The lighthouse is in urgent need of maintenance, and a Finnish interest group is trying to raise funds for its preservation. The lighthouse has been automatic since 1979 and the surrounding buildings are no longer used. The increasing general availability of GPS has made its primary function redundant. Märket has a continental climate affected by oceanic influences; it has a reputation for being one of the windiest places in Finland. A meteorological station has been managed by the lighthouse keepers since 1896 and an automatic station of the Finnish Meteorological Institute was inaugurated on November 10, 1977, shortly before its automation. The effect of the sea is very important to the climate of the island: thermal inertia dramatically reduces the temperature fluctuations during the year compared to the continent and to a lesser extent compared to the central part of Fasta Åland, the largest island of the archipelago of Åland. Märket holds five records for daytime temperatures for weather stations in Finland, all in the period between November 29 and January 1, with 10.2 °C (50.4 °F) on December 15, 2006 and 8.8 °C (47.8 °F) on December 31, 1975. The average yearly temperature is roughly 6 °C (43 °F) and is one of the highest in Finland, with the month of January being milder than on the continent (−2.5 °C or 27.5 °F on average), and a warm summer (15.9 °C or 60.6 °F on average in July). The island is drier than the mainland: the average annual rainfall does not usually surpass 550 millimetres (22 in). ^ Rowlett, Russ. "Lighthouses of the Åland Islands". The Lighthouse Directory. University of North Carolina at Chapel Hill. Retrieved January 19, 2016. ^ "Hyljesafari" (in Finnish). Retrieved 5 March 2019. ^ Shifting Territories: Märket Reef, Hidden Europe Magazine, 11 (November 2006), pp. 26–29. Wikimedia Commons has media related to Märket. This page was last edited on 5 March 2019, at 11:14 (UTC).